Last updated on June 19, 2013 September 10, 2018 by Katie M Anderson for Armagard Ltd.
Sub-zero work environments can cause a lot of difficulties. Much of the equipment and tools that we rely on to do our work can become problematic or even useless when faced with minus temperatures. That’s why finding a reliable cold storage printer can become such a big issue for a range of industries, including food manufacturing, cold storage warehouses and pharmaceutical labs. One key piece of office equipment that doesn’t work in a sub-zero environment is the printer. Instant printing technology is something most of us take for granted, and not having it to hand can have a big impact on staff productivity levels. In order for staff in sub-zero work environments to have access to printed documents and labels, specialist equipment such as a cold storage printer or a freezer printer enclosure need to be used. The reason that printing can be a challenge in sub-zero environments is because a standard printer simply won’t work in such low temperatures. In most cases this is because the printer’s electronics fail to work, but there can also be issues with the ink freezing inside the printer. Some companies try and get round this problem by not supplying printers as part of the work set up in cold environments. This may sound like a simple solution, but it can lead to bigger problems. Whether or not there is a printer in their immediate work environment, staff members will still need to have access to one. In practice, not having printer access at all often means that time needs to be wasted by staff members leaving the sub-zero environment in order to get to a printer in another part of the workplace. The time it takes for staff members to collect print outs multiple times a day can really add up, and this can lead to delays. 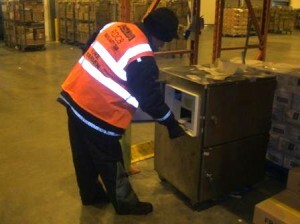 Even small delays can be a problem in process environments, as they can lead to hold-ups with production and shipping. In other words: this small amount of downtime can quickly add up to serious costs. The enclosure is effective up to -22°F. No matter how close the temperature in your working environment gets to this, your printer will continue to work as usual within the enclosure. Not only is the enclosure heated, it’s also fitted with insulation to ensure the area inside the enclosure remains at a safe operating temperature. The enclosure itself is easy to fit into any working environment. 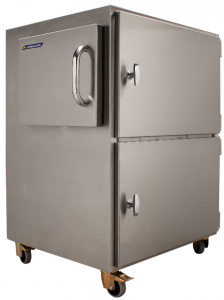 It is made out of washable food grade stainless steel, which means that it is safe for use in even the most sensitive lab surroundings. It also comes on castors for flexible positioning, so it won’t take up any more space than is necessary, and is easy to move around when needed. The enclosure is specially designed to allow easy access to printed documents, and this can be done without having to open up the whole enclosure. This means that the printer can be used in just the same way as it would be if it wasn’t in such a challenging environment, and that the contents of the enclosure never needs to be exposed to the outside temperature. In the case of an error, the enclosure offers easy access. Unlike other cold storage printer solutions, the SPRI-800 enables you to deal with these errors yourself. The enclosure unit can be disconnected easily, and is light enough to be wheeled out of the sub-zero environment. Once this has been done, it’s safe to open the enclosure and manage any errors or jams. This method also makes it possible to replace paper and ink without any unnecessary difficulty or assistance from printer engineers. Once you’ve invested in a printer enclosure, you can be confident that the investment will be with you for quite some time. One of the real benefits of the SPRI-800 is that it doesn’t tie you to one model of printer. In the future you are free to upgrade and replace the printer within the enclosure while still retaining all the benefits from the enclosure itself. In fact, Armagard are so dedicated to innovation that they have their own deep freeze testing facility. 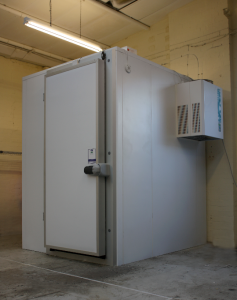 Armagard’s on site testing chamber is able to simulate temperatures from -40°C to 100°C. With this facility Armagard are able to ensure that each of their products is of the highest possible quality. If you choose to invest in The SPRI-800 Stainless Steel Printer Enclosure, you can be sure that you’re benefiting from the very best of that quality.